Here are members of TEAM WOVEMBER represented thusly from left to right: Tom of Holland, myself, Kate Davies (in the form of her wondrous Tantallon design which I am sporting atop my heid) and Louise Scollay. 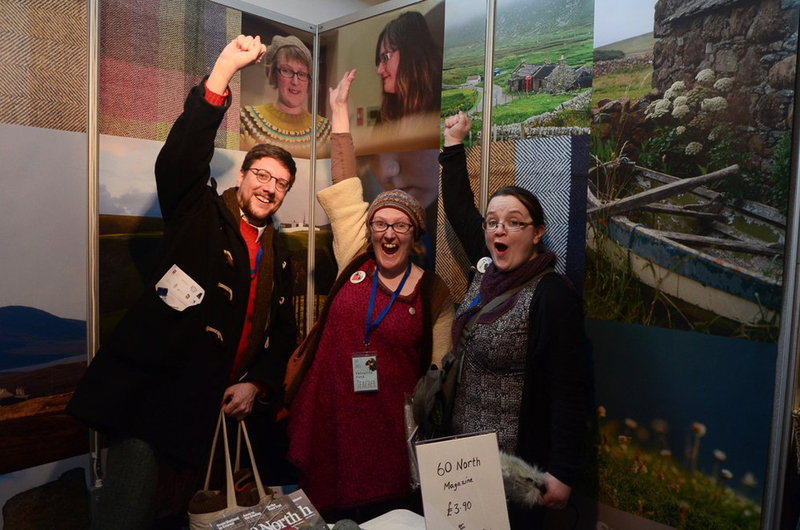 The photo was taken at the Edinburgh Yarn Festival last year by our amazing photographic correspondent Jeni Reid – from whom you shall hear more throughout the month. We are thrilled to be back for another annual celebration of woolly goodness! This year myself and Louise are doing the lion’s share of the work involved in running Wovember. We love wool very much and very deeply, but we are just two people so please be patient if you’re waiting for a response to an email or similar. We have organised the month very carefully so that it can be enjoyable for all, including us. To that end we have some housekeeping announcements and some thanks to say and some love to spread at the start of what will hopefully be a truly joyous month of woolly delights. This year the annual wool-along – the Wovember WAL – is being run a little differently. We would like you to contribute to the online buzz around Wovember by sharing your 100% WOOL projects on social media rather than by emailing them privately to us. This cuts out unwanted extra email work for the TEAM and helps to publicise WOVEMBER more widely online. You can read about WAL prizes and rules here, but the main idea is for you to undertake a creative project using 100% WOOL throughout the month of WOVEMBER and to share it on Ravelry, Twitter or Instagram with the accompanying hashtag #wovemberwal. To be in with a chance of winning one of our amazing prizes please post an image of your FINISHED WAL item on Instagram, Ravelry or Twitter. Include a simple description of the project for context, and use the hashtag #WOVEMBERWAL. There is a special thread on the Ravelry WOVEMBER group board in which you can post links to projects. We are really excited to see what you make and if you are stuck for ideas, check out some of the superb projects made in earlier years for the WAL. This year the annual WOVEMBER photograph competition will be run entirely on instagram and this year it couldn’t be any easier to enter the competition! Just use the hashtag #WOVEMBER2015 when you post your image on Instagram. Anyone using that hashtag on Instagram gets automatic entry. You will be able to see all the entries by searching on instagram for the tag #WOVEMBER2015 and that is where we shall be drawing winners from. If you do not use instagram on your smartphone but wish to see all the entries to the competition you can do that here and there is nothing stopping you from finding a buddy who uses instagram and having them upload your image for you – just make it clear in the caption who took the picture. As with the WOVEMBER WAL, we hope that using a public social media format will help to publicise WOVEMBER more widely, as well as cutting down on unwanted administrative work for THE TEAM! Each Sunday evening, myself or Louise will curate a wondrous post containing selected entries. If your image doesn’t appear in these weekly roundups DO NOT WORRY; you have still been entered into the competition. There shall be prizes and they shall be of the woolly variety and we shall reveal all soon! WE ARE LOOKING FORWARD TO SEEING YOU ON INSTAGRAM THIS WOVEMBER! An early entry to the #WOVEMBER2015 Photo Competition from @inspirationknits! 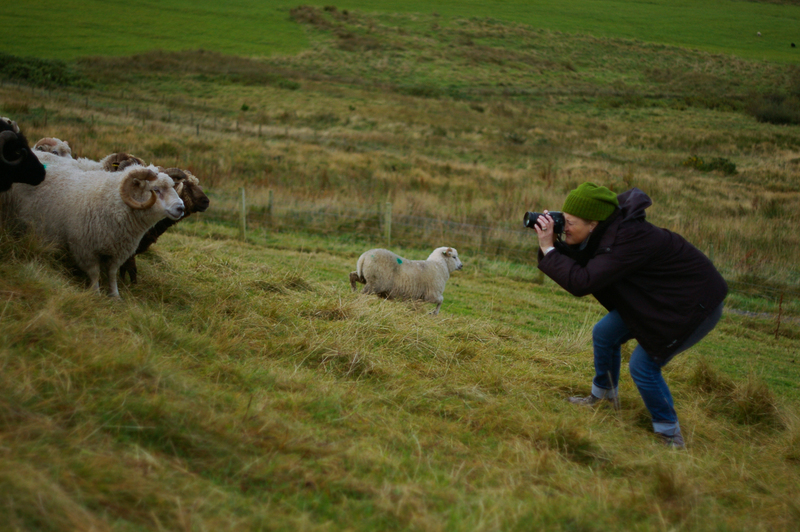 We are thrilled that this year Jeni Reid has once again curated an outstanding collection of wool-themed photos and would like to say a special turbo THANK YOU to our superb woolly photographic correspondent! 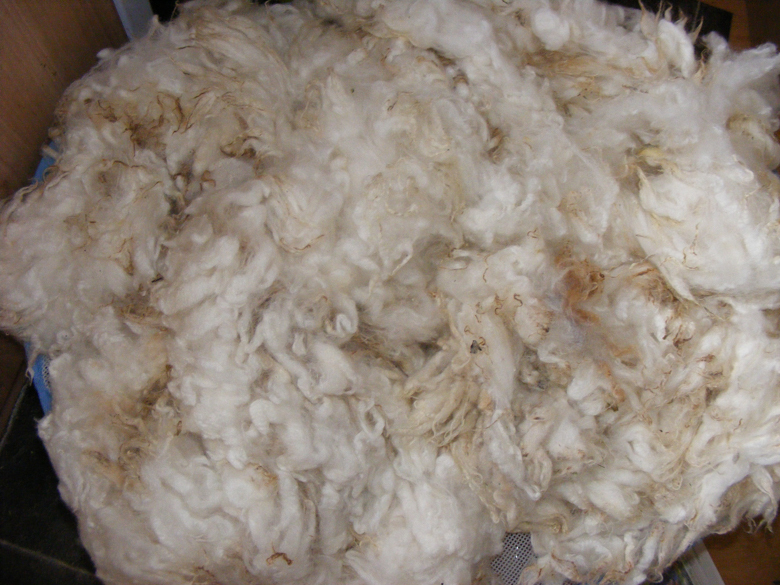 We would also like to say a massive thank you to everyone who has contributed articles for this month long celebration of WOOL – together we can do amazing stuff to raise the profile of this marvelous textile and to help publicise the labour that goes into producing WOOL and the qualities that make it unique and special amongst textiles. We would also like to thank folks who weighed in on our Ravelry discussion for feedback on how to improve WOVEMBER this year. We saw a clear desire in your comments for more information on small producers which is why we have dubbed this year THE YEAR OF THE SMALL PRODUCER. Many of you have expressed an eagerness to support businesses producing beautiful wool but pointed out that these companies are not always easy to find online, and that sometimes more information on a particular yarn is needed in order for you to buy it. As one astute reader commented, “It’s all very well raising awareness of wool, but if that doesn’t lead to more people buying and using it, is the campaign effective?” We couldn’t agree more and will be working hard throughout the month to address this and to help Close The Gap between Producers and Consumers of Wool. We will be continually adding to the menu on the right throughout the month with direct links to small producers of yarn and woollen produce, and publishing content which addresses different points around the expectations of both buyers and sellers of wool. We will also be pointing to small producers whom we have previously profiled here on WOVEMBER in order to make the most of this enormous evolving archive of content! This year WOVEMBER is extraordinarily excited about the Knit British Breed Specific KAL organised by comrade Louise. This collective endeavour to swatch different breed-specific yarns and to document their performance online is an opportunity for YOU to be directly instrumental in Closing The Gap. By road-testing breed-specific yarns and sharing your findings online you contribute to public knowledge about different yarns and their producers, and you help other knitters to discover the glorious woolly treasures of the land. This WOVEMBER I shall mostly be swatching! By popular demand, WOVEMBER badges are back this year and will be available exclusively through my online shop and from the Wool Clip in Cumbria. WEAR AS MUCH WOOL AS POSSIBLE! Finally, if not too busy instagramming your WAL project, accessorising your outfits with nifty WOVEMBER badges and swatching with breed-specific wool, don’t forget to wear as much WOOL as possible, for this amazing textile and its presence in our lives is the very point of WOVEMBER. Welcome to the month, we look forward to spending it WITH YOU!